On September 12th, auditions were held for Gibson Southern Theatre Department’s upcoming spring production of The Phantom of the Opera. The cattle call audition process was divided into three portions: singing, dancing, and acting. Students wishing to audition did a short choreographed dance sequence to the song “Masquerade” , a cold reading of a scene, and sang either “Think of Me” or “All I Ask Of You,” all from the musical. After making their way through all the stations, auditioners were sent home to await their results two days later. On Friday, after fifth period, the cast list was posted. 60 students were overjoyed to see they had made the cast of Phantom of the Opera. Those who were chosen to be in the cast of The Phantom of the Opera will be performing the single largest musical number from The Phantom of the Opera, “Masquerade”, as the opening act of Vaudeville 2012: GSTD Live! These students have been rehearsing every Thursday morning before school, as well as spending a morning of their fall break rehearsing for Vaudeville. 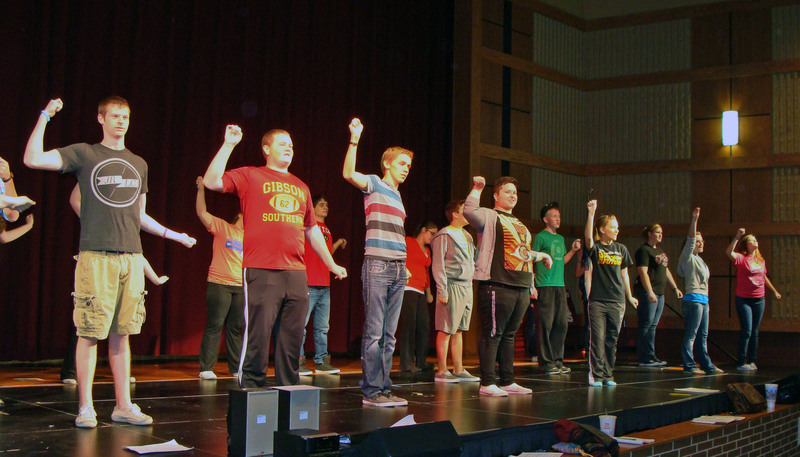 These students will be working up until the production which will run from March 14-17, 2013. Tickets may be purchased now at https://www.gshstheatre.com. Tickets are also available for Vaudeville 2012: GSHS Live!, which will run from November 8-11, 2012, as well as the Young Playwrights Project 2013, which will be held January 19-20, 2013. Purchase tickets for any of these productions at the website listed above. Phantom cast members welcome you to join them at Vaudeville for a preview of the show, and encourage you to purchase your tickets now for the best available seats! The cast of Phantom includes Kenzee Barnett, Natalie Bengert, Hannah Burr, Jesse Collins, Kirstin Connor, Trisha Cosby, Madeline Cox, Miranda Deal, Madison Dillon, Wade Fisher, Lauren Fuhs, Owen Gick, Jackie Goedde, Makenzie Hart, Felicia Hickrod, Jake Higgins, Clara Hirsch, Alexis Kiesel, Sara Kissel, Kelsey Klusmeier, Olivia Mayer, Ryan McBee, Tori Michael, Jordyn Milheiser, Ben Nathan, Kaylie Overton, Mariah Paiz, William Paiz, Ian Peach, Hayden Peach, Sarah Ramp, Jennifer Reidford, Callie Rendle, Tara Reynolds, Dominick Richardville, Chrissi Ridge, Emily Rodgers, Kaitlyn Roth, Kaitlyn Rowe, Christian Rowe, Kortney Schmitt, Jacob Sellers, Abbi Silva, Emily Sisk, Brittany Sollman, Anna Sorg, Drew Steinmetz, Lauren Stuckey, Christa Tenbarge, Krista Tenbarge, Kolten Turner, Jordan Wallace, and Madison Will.